Thank you for visiting our room at the 2011 RMAF show. We had a great time showing you our newest product, the CBT36, and we are very excited to hear your impression of this exciting new technology. The CBT36 is available in kit form exclusively from Parts Express and a fully assembled and tested version is available from Audio Artistry, Inc. Benchmark Audio: DAC1 HDR, USB Stereo Pre-Amp DAC (http://www.benchmarkmedia.com/dac/dac1-hdr). Cardas: Interconnects and speaker cable (http://www.cardas.com/). DEQX: HDP-Express, DSP Crossover/EQ/Room Corrector (http://www.deqx.com/products.php). A special thanks goes to Rick Craig, owner of Selah Audio (http://www.selahaudio.com/), for helping us setup the DEQX active crossover and acting as the DJ picking the awesome line up of music (from over 42,000 tracks on the server!). 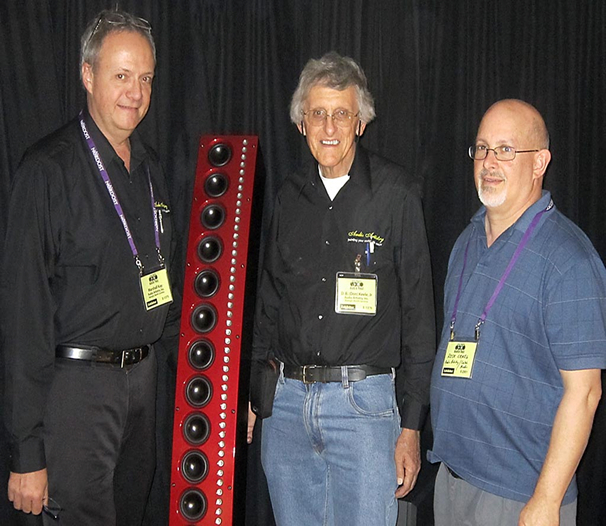 Marshall Kay and Don Keele of Audio Artistry brought their concept to reality in conjunction with electronics supplier Parts Express and its Dayton Audio brand of loudspeaker components to create the CBT36, the world's first broadband constant directivity (CD) loudspeaker system for the home. The CBT36 system provides extremely even coverage and flat frequency response at all locations in the listening room. http://www.dbkeele.com/CBT.php for in-depth information on the CBT concepts. Each CBT36 contains 18 each 3-1/2" full-range drivers, used as mid woofers, and 72 each 3/4" diameter wide-band tweeters, that are crossed over at 1 kHz. Initially, the system will only be available in a bi-amped version but later a passive crossover may be offered. The drivers are mounted on a front panel that has a 36° circular-arc with the system standing about five feet tall and a width of about 7 inches, and a depth at the base of about 25 inches. The 3-1/2" drivers are Dayton Audio's ND91, which were designed specifically for the CBT36 system. The ND91 utilizes a Neo-Balanced 1" underhung motor that is capable of over 10 mm of peak excursion and features a shorting ring to help keep distortion under control. The 3/4" diameter tweeters are also made by Dayton Audio, and are mounted on pc boards in groups of four to ease assembly and optimize center to center spacing. The CBT36 has been specifically designed to operate over a reflective ground plane and does not suffer from destructive floor-bounce effects. The curved line array of 72 tweeters extends all the way down to the floor to take advantage of the ground-plane acoustic reflection. Effectively the floor provides a reflective surface that acoustically extends the array below floor level and thus creates an array that is over 10 feet tall and controls vertical coverage and directivity down to below 160 Hz! The above-the-floor vertical coverage of the CBT36 is a narrow 28º which is extremely stable with frequency. This greatly reduces ceiling reflections as compared to a typical box style system. In addition, the horizontal coverage which is very broad narrows as you go around the side of the system, which also significantly minimizes side wall reflections. The system has extremely well-behaved and smooth coverage from locations well above the array to points even down at floor level, and at distances from directly in front of the speaker to points in the rear of the listening room. The horizontal coverage is extremely broad and uniform even out to plus-minus 90 degrees. The CBT36's variation of loudness with, distance is also very unique. At standing height, the system's volume level hardly changes over a range from directly in front of the system to points 10 feet away! The system can be played extremely loud and remains very clean and effortless at all levels. The large number of drivers minimizes distortion, and driven with powerful amplifiers the system can generate very-high instantaneous peaks. At this time, the CBT36 system is only available in kit form. Although the MDF cabinet is pre-assembled, it needs to be finished. The drivers will also need to be mounted and wired to complete the system. A comprehensive video is available to ease construction.The system must be bi-amped and requires a DSP-based speaker processor along with two stereo power amplifiers. For extended bass response below 45 Hz, one or two powerful subwoofers are required. Note: This whole crazy piece was written by me Don Keele, with some Parts-Express help on the "DRIVERS" section, and I take complete responsibility!